Glad you stopped by! 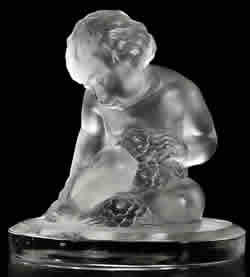 Here we report R Lalique news, auction results, upcoming event information, and our observations and opinions about the entire World of R. Lalique. If there is any topic you’d like to see covered, please drop us a note at info@rlalique.com. All R Lalique enthusiasts, all admirers of Rene Lalique, and all interested R Lalique collectors and observers are welcome to participate. Comments, additions, corrections, new information, and bug reports, are greatly appreciated!! Hope to see you hanging around the Blog! Our Web Host (Network Solutions) had some problems last night, the result being that our server was down for some time and the site was not accessible without even a “temporarily unavailable” page appearing. We went with Network Solutions when we first started because they have a reputation for reliability, and we didn’t expect this could happen. For those of you that tried to access the site and found it unavailable, we’re sorry for any inconvenience it has caused. We also see that many of our search rankings went in the tank this morning for the first time ever, and don’t know if it’s related or not to the fact that the search services would have been unable to find the site (see “Dumb Luck” posts for discussion on our search standing…. well, our former search standing:). Anyway, we’re working with Network Solutions to try and make sure it doesn’t happen again. 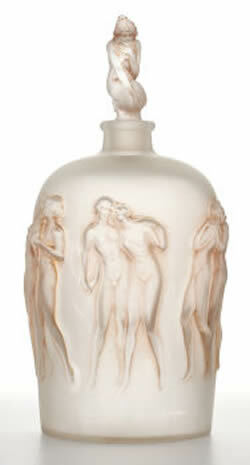 And of course the good news is we are up and running, several new worldwide auctions have already been posted this morning in our RLalique At Auction Section, and some new For Sale Items will be coming online today in the RLalique For Sale Section including the wonderful Six Figurines et Masques Vase shown here. Yahoo Search Joins The Believers! Now we’re No. 1 in your hearts AND No. 1 in your Yahoo search! RLalique.com was found by Yahoo this weekend! Amazingly, we are listed in their search for rlalique as Number 1!!!!! 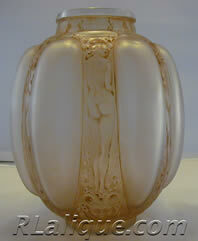 AND, we are in the top ten for the other typical searches such as r lalique, or r. lalique. Totally great! Hope our good fortune continues in the “search” department. It might be that our vast content overwhelms the efforts of paid search engine consultants and puts us on top. And of course, there is that factor that we talked about previously in regards to our Number 1 ranking with Google’s search engine; see movie poster :). We hope our good fortune continues. In just the couple short weeks that RLalique.com has been up and running, even Google has taken notice!! This morning, we typed the keyword rlalique in Google, and guess who is the Number ONE Google search result ….. OK, you probably can figure who it is since we are making a big deal about it, but it’s RLaique.com! Yippee! 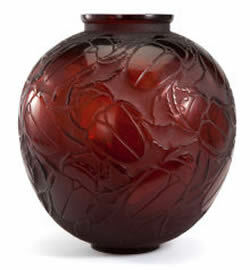 We are also in the top 10 already for what we think are the other typical searches: r. lalique, r lalique, and r.lalique. Unbelievable! Go to Google Search and check it out for yourself. You’ll see us right there at the top of the list. Anyway we are enjoying our new status, since for all we know we can go down to number 100 in a week. And unlike a lot of web sites, we don’t pay anyone to work on getting us search rankings. So it’s either what grandma always said about good things happening to good people (OK, probably not that :), or just dumb luck. Hmmmmmmmm…………….